Interested in non-GMO, organic foods? How about Fruits and Vegetables that keep for years? You heard me right. Fruit that last for years. Vegetables that wont go bad anytime soon..and loads of natural goodness that’ll have your taste buds talking. What is this magic food you ask!? It’s Activz fruit and veggie whole-food powders. They’re 100% organic, healthy, and contain no GMO’s! You can add these powders to anything you want. Below I’ve tested a couple of the powder flavors on several dishes, and you better believe I’m not even close to being done having fun with this stuff! The best part? You can get a whole serving of fruits or veggies tossed into things like pasta sauce or a smoothie. Just scoop it and mix it. No need to run to the grocery store twice a week, just toss some powder into your favorite dish or even whip up a smoothie. The possibilities are endless, give it a try! I don’t know about you, but it seems fruits and veggies don’t last a week in our house before being on the ‘iffy’ side of things. We usually buy bare minimums of fruit and veggies, because if we buy a weeks worth, something goes bad before we get to use it. We end up throwing a lot away and wasting a ton of money. 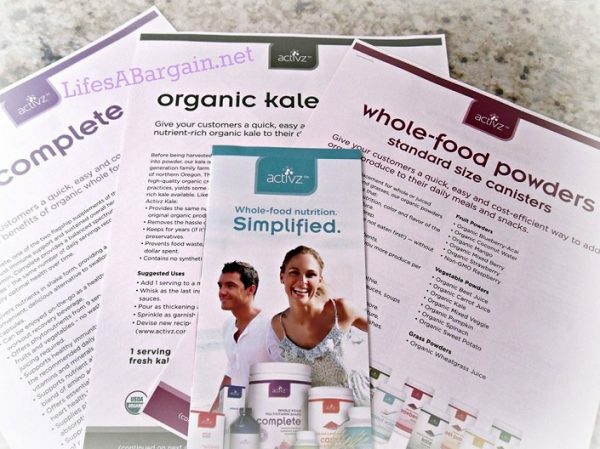 Now that we’ve discovered Activz whole-food powders, we don’t need to buy as many fruits and veggies, if any at all. Activz can be a replacement for your daily vegetable and fruit servings. If we plan accordingly, we can plan a whole weeks worth of meals using Activz and still get all of our fruit and vegetable servings every day. Activz is an alternative to fruits and veggies that wont go bad, or need the “sniff test”, before being used. These powders stay good for years and you can get your daily servings of fruits or vegetables anytime you wish, with any meal you like. We used the Mixed Vegetables Powder in spaghetti sauce. We added 1 serving worth of the powder to the sauce. I feel confident that you could add a couple servings of the Mixed Veggie Powder to your sauce without the flavor of the veggies taking over (not that that would be a bad thing!). Directions: Place tomatoes, butter and onion chunk in sauce pan and simmer for about 30 minutes. Stir in the Activz Mixed Veggie Powder and continue simmering for 15 minutes more. Make sure you mash the tomatoes while you’re simmering. After the 45 minutes is up, remove the onion, stir and serve over pasta. Add some Parmesano-Reggiano cheese over the sauce if you’d like as well. Yum! 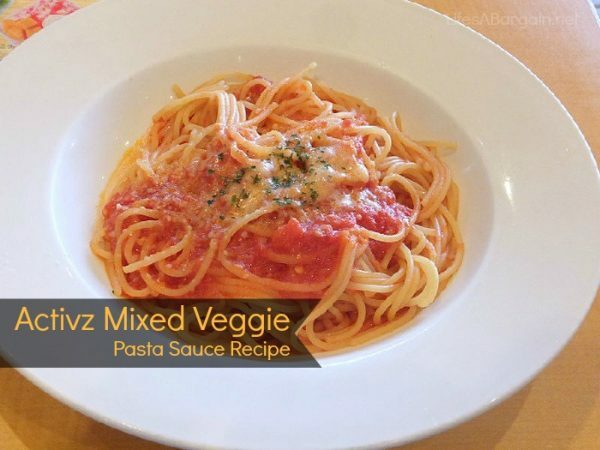 The Activz Mixed Vegetable Powder gives the spaghetti sauce a nice flavor. It wasn’t overpowering at all and blended right in very well. It’s a super quick and easy way to get your veggies! 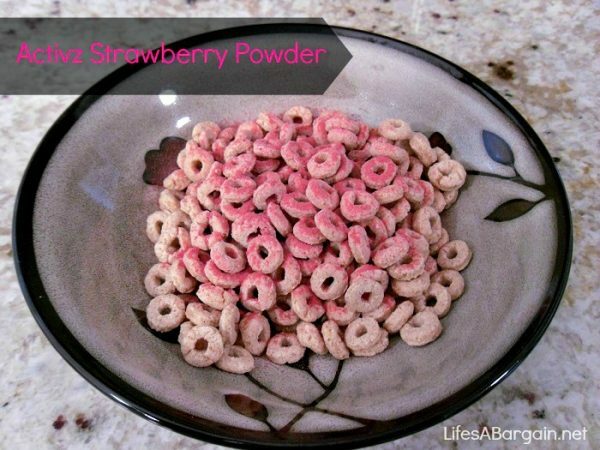 Using the Strawberry Powder is a great alternative to using whole strawberries in a smoothie. I used 1 serving (two tsp.) 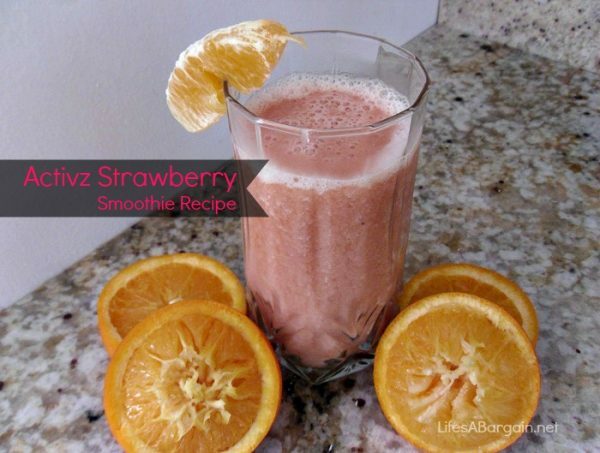 of the Activz whole-foods Strawberry Powder in place of strawberries in this Orange, Strawberry and Banana smoothie. It came out delicious! This is one smoothie I recommend trying – it’s really good and good for you too! Directions: Blend it all up until it’s nice and smooth, then enjoy! The first thing I tried was some Strawberry Powder on cereal. I put a whole serving (two teaspoons). It was probably too much for such a small amount of cereal, next time I will add only 1/2 of a serving. I quickly learned that the flavor is very strong, a little goes a long ways. 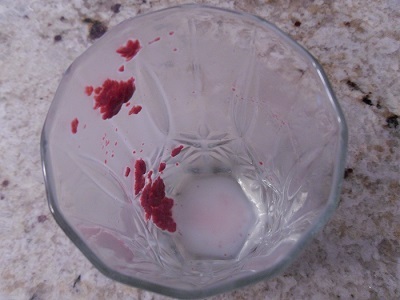 Also with breakfast, I had the smart idea of putting some Strawberry Powder in milk – maybe I can make strawberry milk! It didn’t work as well as I thought it might. The powder became clumpy – lets just say it didn’t work. Finally, we tried the Activz Pumpkin Powder. Our first thought was Sunday morning Pancakes — how about making them into Pumpkin Pancakes… or better yet, Pumpkin Chocolate Chip Pancake!? Yum! There really is no recipe for this, you can use what ever pancake recipe or pancake mix (yes even the Complete mix) with this powder. We had some Complete Pancake Mix on hand (thank goodness because we were out of eggs!) so we used that. 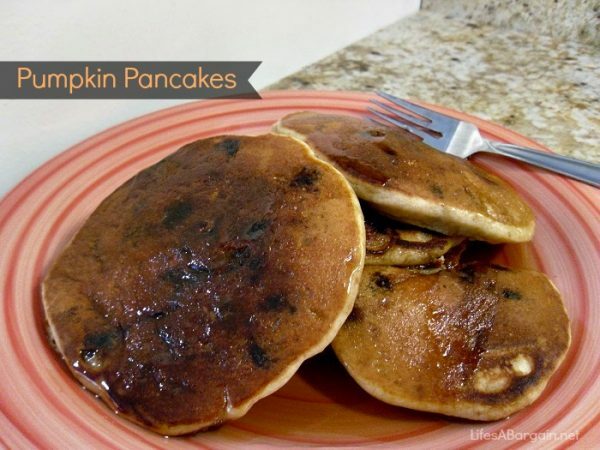 We made 8 pancakes and added 1 serving of Activz Pumpkin Powder to the mix. Although we added a whole serving (two tbs) of Activz Pumpkin Powder, the pancakes didn’t have a strong pumpkin flavor. Maybe it was drowned out by the Maple Syrup or the chocolate chips, or maybe we should have added more pumpkin. We don’t really know why the pumpkin flavor didn’t stand out, but we did get a whole serving of pumpkin in our breakfast! Perhaps next time we’ll add more! The great thing about Activz Powders, no matter what the flavor (or lack of) in what ever dish you make, you’re going to get all the benefits of the vitamins and nutrients that whole fruits and vegetables provide! So, even if the flavor is missing from your dish – know that you’re still adding a serving (or more) of fruits and veggies to your meals! Overall, we found these powders easy to use in things we’re already making. They’re an excellent replacement for fruits and veggies that can go bad while they’re waiting to be used. The Activz Whole-Food Powders last for years (if you don’t use them first!). I think you’d be very happy with these powders and are definitely worth trying for yourself. Stop by and visit Activz On Facebook!